Please check our duplicate mp3 finder application as well. It is the best in its class, since it compares audio files by their sound, not tags. Duplicate Video Search is able to find duplicate video by its content. Great video comparer. Have you ever felt uneasy when showing your digital photo collection to somebody? Probably, everyone has. Digital collections are pretty chaotic and full of unnecessary images which look very similar to each other. How does it happen? Well, trying to find the best view and get the best shot, you often make lots of very similar photos and forget about them. If your collection isn't so large - no problem! And what if there are thousands of images? Right, you start losing control over your collection, and here problems begin. No wonder - handling huge collections manually is hugely time-consuming! That's precisely what duplicate image finder is meant for! It brilliantly works with images having file formats JPEG, RAW, J2K, GIF, BMP, PNG, RAW, TIF, PSD, TGA, and many others. Image Comparer scans through the whole collection of yours. It takes seconds while doing it manually you would probably spend hours if not days! Moreover, it analyzes the content of digital images, not just file properties. While you're relaxing, it literally "looks" through your pictures and groups those that look alike. Besides, it even highlights the differences between similar photos. You can view them in pairs (very convenient!) or see the top ten similar images and choose the best one. 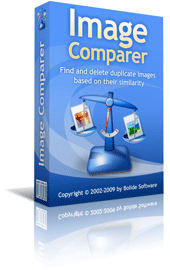 Image Comparer helps you automatically locate complete duplicates and similar looking images. The software is very fast, and in seconds you have presented pairs of clones. All you need to do is to tick the files to be deleted. At that, you're shown how many images are going to be eliminated and how much space is going to be saved after removing them. You can also let the program do that for you. As simple as that! Having once analyzed and handled your photo collection with Image Comparer, you may relax and forget the nightmare of manual processing your image collection. That's possible because our program has got an excellent memory! Every time you add new photos to the group, the program compares them to the existing ones. So, duplicates have no chance! Image Comparer won't allow copies to appear again in your collection. 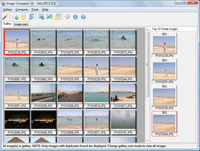 Don't hesitate and download Duplicate Image Finder now - you're not losing anything! You've got 30 days to try and evaluate the program. In the trial version, you can find photo duplicates, but you can't move, delete or copy images. You'll see it's one of the best at the software market!